Aeon Timeline brings Visual Timeline Software to your phone or tablet. It is packed with features for creative writers, project management, case management, historians and student projects. 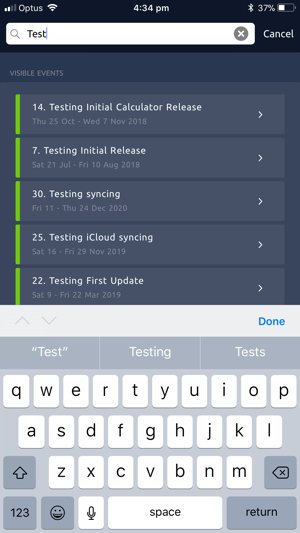 Use iCloud or Dropbox* to sync your timelines between all of your iOS devices and your Mac* or Windows* computers, so that you have your project at the tip of your fingers wherever you like to work. * Note: Desktop (Mac/Windows) use requires a separate license purchase. Dropbox support requires iOS 11 or later. 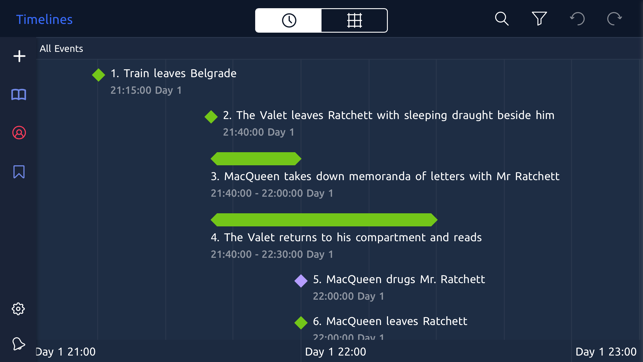 Whether you are in the opening stages of planning a novel, in the final stages of editing, or anywhere in between, Aeon Timeline has tools and features to help you understand your characters, avoid plot holes and inconsistencies, and visualise your story in new ways. - Create your own custom fantasy calendar if your story takes place off-world. 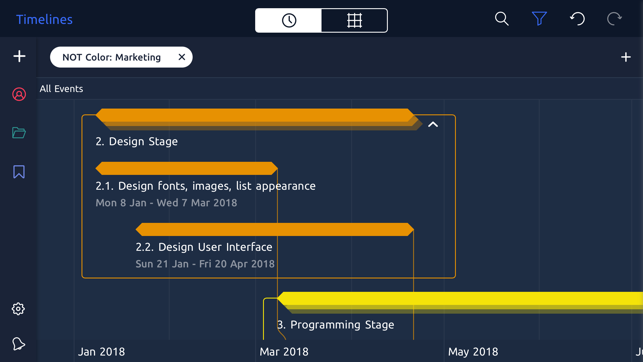 A little like a Gantt chart but a lot more flexible, Aeon version 2 allows you to plan multiple projects and keep them up to date throughout their lifetime. We know that few plans can survive the first few weeks of activity, so we make editing and moving your plans intuitive and straightforward. 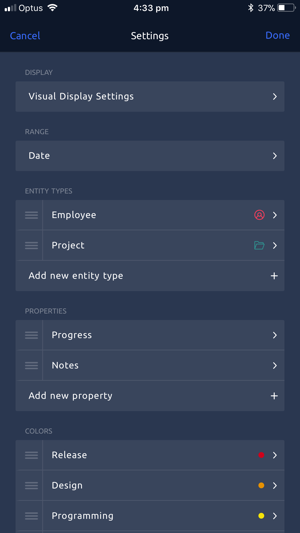 Our pre-configured editable templates allow you to start a project for just about any reason. - Add your own images, external links, notes and research to your events so that you have everything you need linked from a single location. - Zoom to the time scale you wish to see: anything from billions of years to individual minutes and seconds. - Add bookmarks within your timeline so that you can easily jump between key milestones. - Choose from a number of timeline styles, including absolute dates, relative dates (Day 1, Day 2), and numeric timelines. Like I said above, I really want to like this app. Primarily my issues involve how frustrating it can be to create a simple sequential list of events. Especially when viewing a list of events, I want to be able to drag and reorder the list. I also want to drag/drop an event to nest it beneath a parent, and likewise easily easily create a sequential link between events. 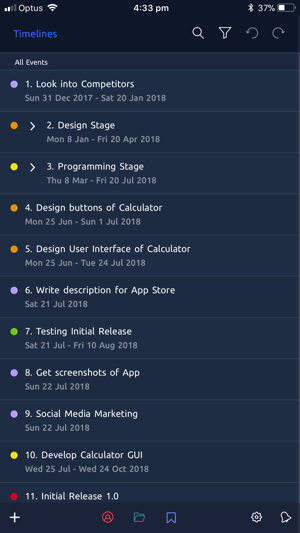 Every other outlining application has functionality like this, but until Aeon does I don’t see how I can justify the horrendous amount of time it takes on iOS to create a simple list of consecutive events. If you’re a user of both Scrivener and Aeon Timeline on the desktop you’ll be delighted to hear that you will now have access to your Aeon-synced metadata (Scrivener keywords!) as well as your specialised timeline data. 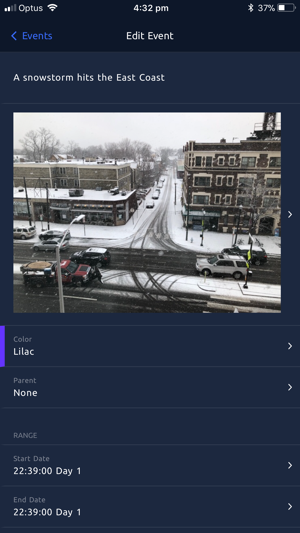 I’m able to edit this data while out and about with my iPhone, and sync changes when I'm back at my desktop computer. Sadly, Scrivener for iOS and Aeon Timeline for iOS can't communicate directly. But within iOS, Aeon Timeline is still a great writing adjunct. Love it even though I didn’t think I needed it! 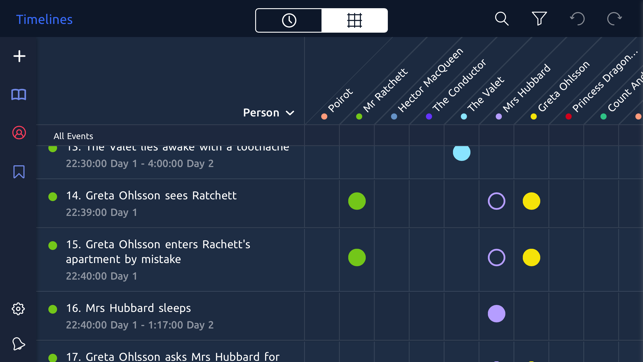 I loved Timeline when I first started using it a few years ago and loved the power and flexibility it gave me in working with timeline elements, organizing them and using the various tools to view them so I could see patterns and relationships. I didn’t think I would need or want a mobile version, but it is so slick, works so well and is so seamlessly integrated with the OS version, that I am amazed at how useful the iOS is. I use on both my iPad and my iPhone, but I prefer the iPad if I am adding new elements. Great job!